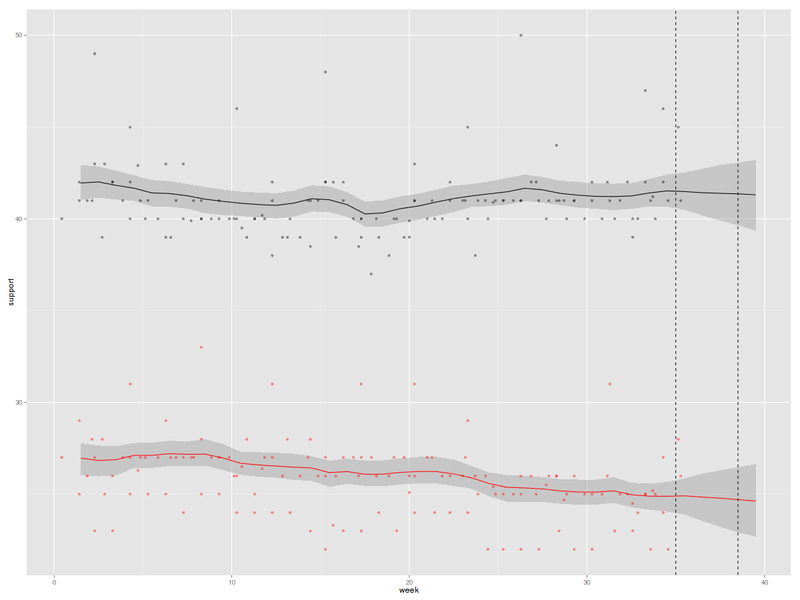 Exactly three weeks before the 18th Bundestag election, it’s time for another look at the polls. This weekend brings six new entries: One late result from week 33 that was only published a week ago, three polls from week 34, and two that were conducted this week, with fieldwork done from Monday/Tuesday to Wednesday. For all purposes and intents, that means that any possible fallout from the Western (non-)intervention in Syria will not be reflected in the polls. As always, there is a good deal of variation in the published figures. The range for Merkel’s Christian Democratcs, for example, is 41 to 46 per cent. But for what it is worth, the model is ever more confident about the outcome of the election: The estimated probability of victory for the governing coalition is now 85 per cent (up from 78 per cent) even if one ignores tactical voting by CDU supporters. If this “loan vote” is factored in, the probability of a coalition victory is 94 per cent (up from 90). Unsurprisingly, the probability of a Red-Green majority is still estimated as zero. The one remarkable change is the modest slump in support for the Greens, which have lost about two points over the last four weeks and are now well below their peak support of about 15 per cent in March. 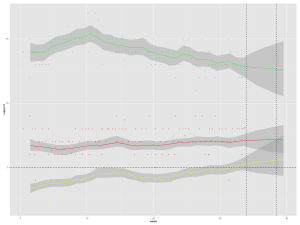 The slow upward trend of the Liberals is unbroken, and the Left is safely above the electoral threshold. Support for the two major parties is perfectly stable. Since my interest here is (mostly) academic, I also began comparing past predictions (from week 33) with current estimates. 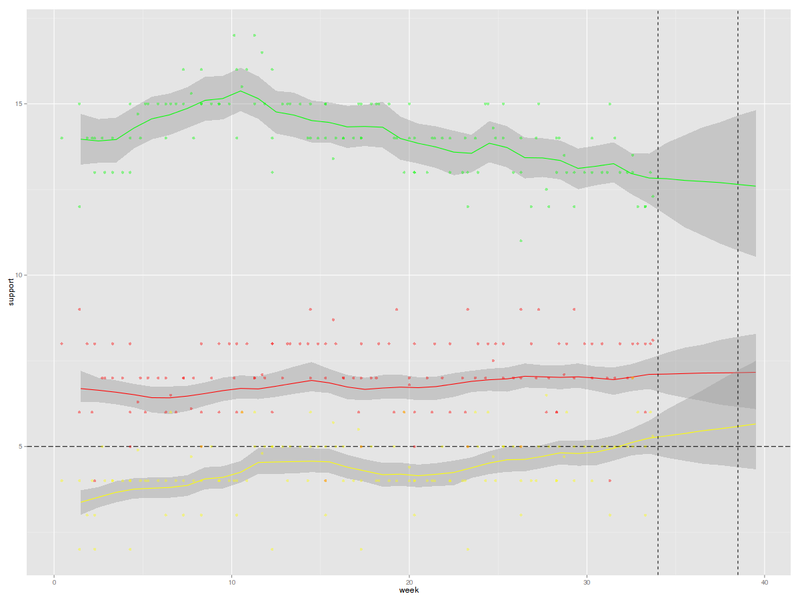 The differences are small, but there is one interesting exception: Support for the Greens is now estimated to be 0.8 points lower than it should have been, given the information that was available two weeks ago. So it would seem that their support is indeed suffering from some random shock. Today is the day of the televised debate between Steinbrück and Merkel (in Germany, known as “the Duel”). While we are professionally obliged to watch it, I don’t think that it will make much of a difference. Both candidates are extremely well known knowns. I also don’t think that Syria will matter for this campaign. Have I just shot myself in the foot? Probably. Come back next week for the latest batch of surveys. All surveys deviate from the true distributions of the variables, but some more so than others. This is particularly relevant in the context of election studies, where the true distribution of the vote is revealed on election night. 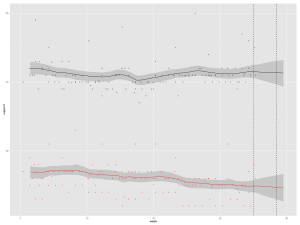 Wouldn’t it be nice if one could quantify the bias exhibited by pollster X in their pre-election survey(s), with one single number? Heck, you could even model bias in polls, using RHS variables such as time to election, sample size or sponsor of the survey, coming up with an estimate of the infamous “house effect”,. ). Of course, our measures can be applied to the sampling of any categorical variable whose distribution is known. We fully develop all these goodies (and illustrate their usefulness by analysing bias in French pre-election polls) in a paper that (to our immense satisfaction) has just been accepted for publication in Political Analysis (replication files to follow). Our module survebias is a Stata ado file that implements these methods. It should become available from SSC over the summer, giving you convenient access to the new methods. I’ll keep you posted.